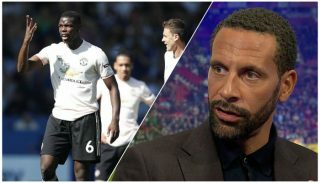 After a week in which Harry Potter author JK Rowling and stuffed talking head Piers Morgan battled on Twitter over the latter’s support for Donald Trump and outrage at being told to f**k off live on American television by Aussie comedian Jim Jefferies, a certain goal-scoring wizard had his own hat trick adventure at Old Trafford in a Europa League Round of 32 first leg clash with St Etienne. 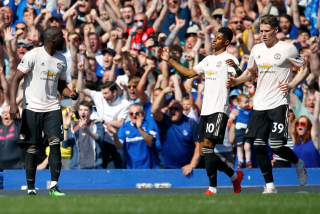 Three unspectacular, almost undeserved goals later, Manchester United were all but assured progression in their quest to make a top four finish in the Premier League unnecessary. United didn’t start well. Eric Bailly twice made poor back passes, the second sending Romain Hamouma in free on Sergio Romero’s goal. 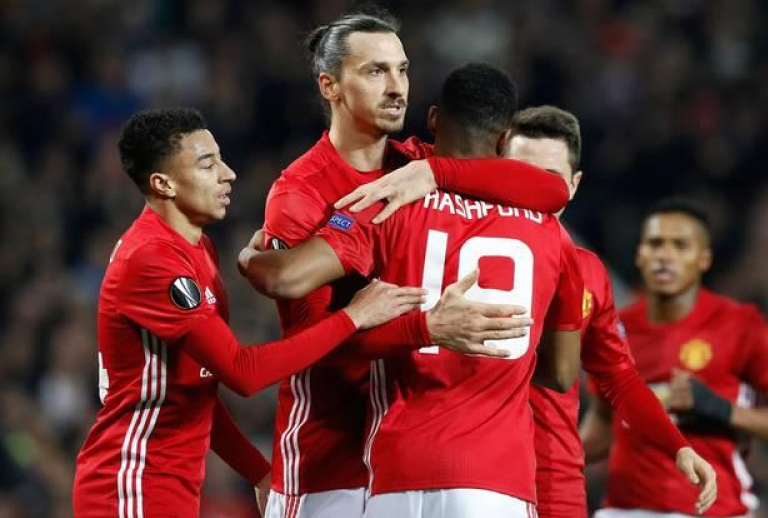 Unlike recent instances when United players have made critical errors, teammates were there to pick up the slack. Romero slid out, making himself large enough to induce Hamouma to circle around to seek out a teammate in front of the unmanned goal. Other defenders reacted just as well, however, while Romero leaped to his feet to continue harrying the St Etienne forward, forcing a rushed pass that was cleared away from danger. Les Verts would mount several counterattacks throughout the first half, but after their nervy beginning, Bailly and crew settled in to possession and control. It wasn’t long before the visitors were chasing the match. On the quarter-hour, Zlatan Ibrahimović went down easily just outside the box. Czech referee Pavel Královec was in a buying mood, awarding a free kick. Ibra sized up the wall and decided to try to sneak the ball underneath when they jumped. Only, the defenders never left their feet. Still the ball inexplicably pinballed through, skittered untouvhed between an offside Anthony Martial’s legs as the oblivious United winger spun around searching out the deflection, then well to fallen goalkeeper Stéphane Ruffier’s left, into goal. Zlatan spread his arms out to receive the Old Trafford faithful’s adulation wearing his best exactly-how-I-planned-it expression as though he wasn’t playing for a club whose manager had not so long ago labeled his side the Premier League’s unluckiest. United wasted several golden opportunities in the half’s remaining thirty minutes, most notably Juan Mata’s perfectly timed run that forced a double save from Ruffier. The Spaniard was also offside for an Antonio Valencia cross, negating a goal from Marouane Fellaini. 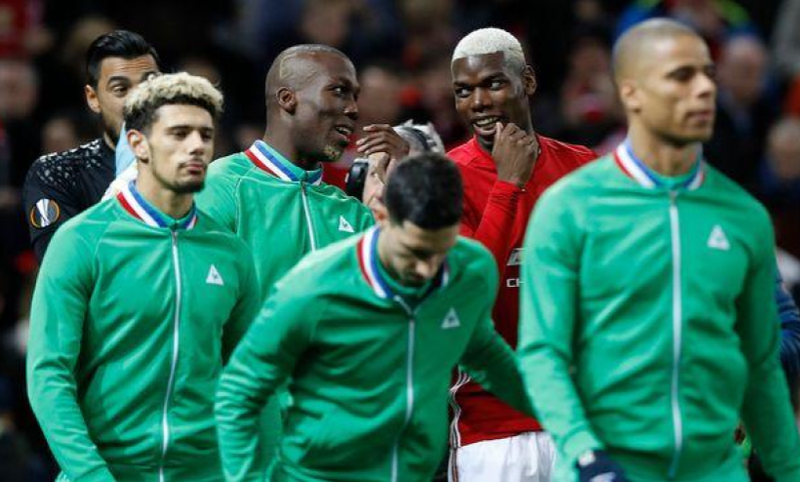 When he wasn’t attacking the goal, Mata engaged in a fierce battle with the elder Pogba in the contest, St Etienne defender Florentin, brother of Paul. The resemblance between the Pogbas is startlingly strong, not just a case of looks but also expressions, movements, and mannerisms. 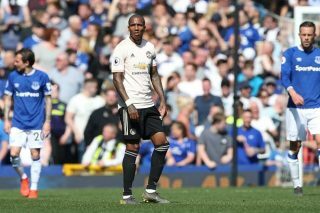 Most importantly for United’s number eight was Florentin was nearly the match for his brother physically. Despite being knocked on his kiester more than once, Mata battled gamely, giving as much as he got in an outsized matchup. The tussle brought out his feisty side. After diving into one or two rash challenges, Mourinho was for once wise in bringing him off for Marcus Rashford after seventy minutes. When the half ended one-nil, with the Fox broadcaster on my live stream touting Les Verts’ record for scoring at the death throughout their group stage matches, memories of United’s dropped points late against numerous opponents had fostered fear the French side would somehow produce a dreaded away goal. José Mourinho’s scowl as he made his now typical early bolt for the dressing room plainly indicated similar concerns. After the restart, Fellaini was on the bench in Jesse Lingard’s favor. The Portuguese had no interest in sitting on a slender advantage. He wanted his side to go for it. Go for it they did. Ibra rang a header off the crossbar then had a second United goal waved away for offside. In the end, Rashford delivered the breakthrough. He made another, now familiar raid towards the end-line, then squared a ball through a knot of St Etienne defenders. Ibra was standing alone at the far post, looking as though he was waiting for the 250 bus. The ball he nudged into a gaping goal could have been a crumpled flyer sent into the gutter after the breeze had wafted it onto his foot. Arms spread to accept more adulation as he waited for young Rashford to arrive for a well-deserved hug. With the score now two-nil, worries regarding an away goal were still prevalent. A third strike was needed to render such an eventuality moot. In order to achieve it, Zlatan this time allowed the St Etienne defense do the work. Collecting the ball just inside the eighteen to Ruffier’s right, Ibra calmly turned away as two green-clad defenders rushed out to close him down. When Kevin Théophile-Catherine gently nudged him, Zlatan went down clutching his shin. If we’re going to call it theatrical, let’s just go the whole nine yards and say Donald Trump could have been tweeting about the Swede rather than Meryl Streep when he used the term overrated actor. I agree with the American pundit (and former defender) Alexi Lalas that it was a foul, that there was contact, and that it isn’t Ibra’s job to remain standing. Nevertheless, I can’t help but sympathize with St Etienne, who had their own shout for a spot kick ignored when Daley Blind tripped Jorge Intima at the opposing end. 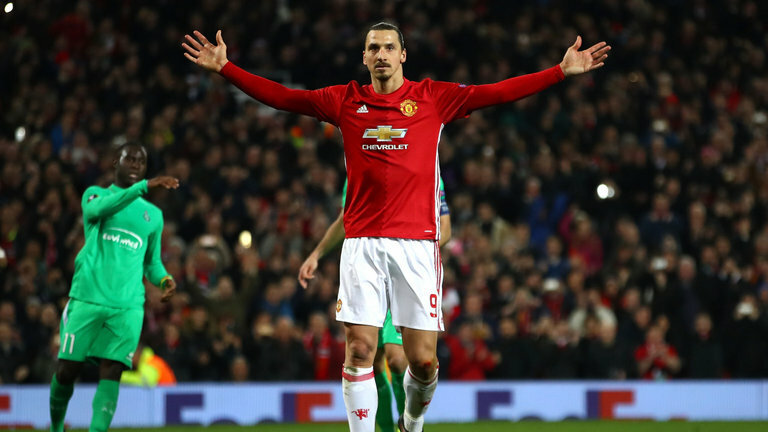 Where my opinion diverges from Lalas’ is in his assessment of Zlatan after the top-knotted forward sent Ruffier in the wrong direction, completed his hat trick, raised his United season total to twenty-three in all competitions, and spread his arms to once again accept his minions’ love. Lalas indicated it was Ibra’s job to score goals and that fans didn’t pay to see spectacular strikes, rather any and all so long as they are delivered on a consistent basis. For my part, I live to see Zlatan be Zlatan, to attempt the outrageous and audacious, then bask in his achievements as though he were a god among men. Although I’ll happily take every goal Ibra gives, I feel cheated when they are the type a center back on crutches wearing a blindfold could have managed. I’ve been spoiled watching him over the years. That said, you and I are unlikely to see Ibrahimović when the second leg kicks off in St Etienne on a rare Europa League Wednesday in six days’ time. 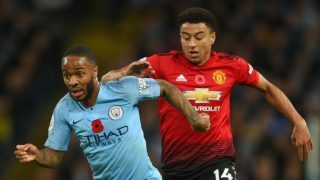 The three-goal advantage presents Mourinho an opportunity to rotate his squad even more than he would have otherwise been forced to do through Ander Herrera’s suspension for accumulated yellows. Paul Pogba’s presence will probably be determined by whether his brother is healthy. If Florentin’s injury is not serious, the match may represent the final opportunity for the siblings to play one another in an official match. I can’t see the boss denying his most important summer acquisition such an emotional moment, though sitting Pogba down if his older brother is not in the line-up makes sense. In Ibra’s case, it makes the most sense of all. While he may believe he is a god among men, he needs to rest. There will be many matches before the campaign ends wherein he will need to deliver, none as easy as his hat trick in this one.